I know you all are excited about today’s post. Isn’t it an interesting title? Loved it, right! Mirror Mirror On The Wall. Do you look at mirror often? What do you see? Mirror will show you what you want to see. So the real question is what do you want to see? 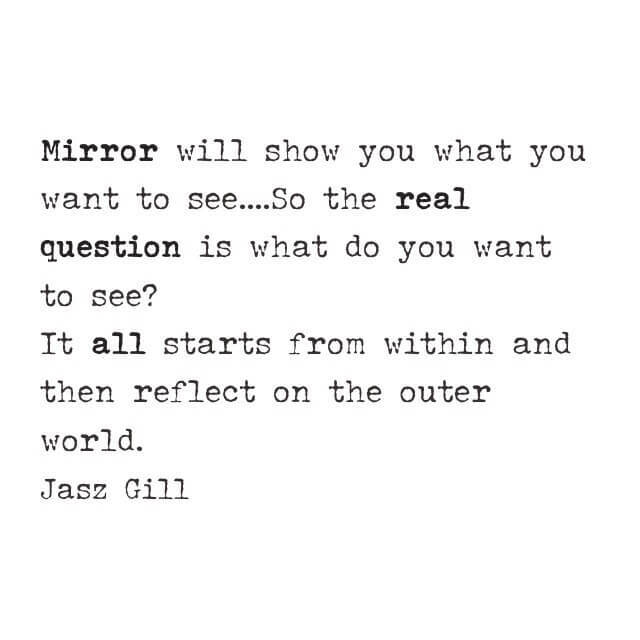 It all starts from within and then reflect on the outer world. The most important thing is what do you want to see in yourself? Do you want to see beauty or flaws? Do you want to see virtues or vices? What is your vision of yourself? The Great Alexander thought of him being invincible before he went on to conquer the world, remember the story I shared about Alexander (if not, here it is). Validation of your being should come from none other than yourself. Give it a little thought, If you do not love yourself, who else will? If you do not respect yourself, why would anyone care? If you do not pay attention to your goals, no one else will. A famous poet Rumi has written; what you seek is seeking you. My word to you is let’s seek something beautiful. My fav post is right here. I cannot find myself agreeing more to this post. I hope in future, you can post a guide to process. Because that is difficult part. Hey! I’m at work surfing aroynd your blog frm my new iphone! bloog and look forward to all your posts! Carry on the excellent work! These are in fsct fantastic ideas in concerning blogging. How prolonged have you ever been running a blog for? browsing tɦrough some οf the posts Ӏ realized іt’s new tߋ me. Anyhow, I’m definitely delighted I discovered it and I’ll be book-marking іt and checking back regularly! Every weekend i used to go to see this web page, as i wish for enjoyment, since this this site conations in fact fastidious funny material too. Excellent way of telling, and fastidious article to obtain facts about my presentation subject matter, which i am going to present in college. views art through a different lens. Love you! Nonetheless, the posts are very quick for newbies. May you please prolong them a bit from next time? this website’s post to be updated on a regular basis. It contains fastidious information. get irked whilst other people think about worries that they plainly don’t know about. now, my friend, all about the here and now. Asking questions are really good thing if you are not understanding anything completely, except this paragraph gives fastidious understanding even. But time was almost running out so i misinterpreted the process. And one other nice coincidence, that when humans hear bird song, they also respond favorably. with an adept ability to mimic human words and expressions. Thanks for sharing your thoughts about rosecoloredglasses. naturally like your web site however you need to elaborate more on posts like this to explain detailed view for beginners. Can you write an article on Self Image? site regularly, if so then you will without doubt get nice experience. A lot mre people should reead this and understand this sidre of your story. long time now and finally got the bravery to go ahead and give you a shout out from Atascocita Texas! when I get home. I’m shocked at how quick your blog loaded on my phone . Great article. I am facing many of thes issues as well..
blog and I am impressed! Very helpful information specifically the last phase 🙂 I deal with such information a lot. Hello my friend! I want tto say that this article is awesome, great written and come with almst all significant infos. I’d ljke to see more postys like this . Hi! This is kind of offf topic bbut I need some advice from an established blog. not sure where too begin. Do you hawve any tips or suggestions? Keep up the good work, I read few articles on this internet site and I think that your blog is rattling interesting and has got bands of wonderful information. In the start he was very timid … he was kind of to himself.